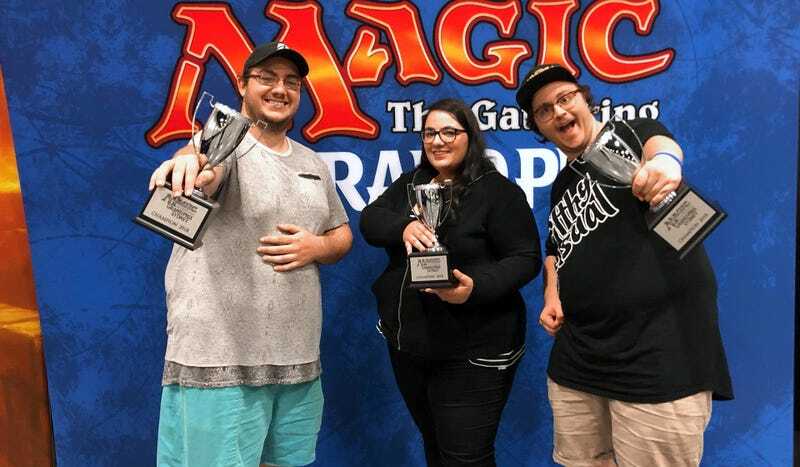 Sydney’s Jessica Estephan has become the first woman to ever win a Magic: The Gathering Grand Prix at the game’s Sydney meet over the weekend. Estephan, along with Ryan Lewis-Jonns (Sydney) and Lachlan Saunders (Canberra), emerged victorious in the Team Grand Prix from a field of 350 entries, beating rivals from Australia and New Zealand to the prize. Magic Grand Prix have been running since 1997, so this has been a long time coming. The winners, along with second, third and fourth place, have all earned an invitation to Magic’s Pro Tour 25th Anniversary in Minneapolis in August. Lechlan Saunders, Ryan Lewis-Jonns and Jessica Estephan.